PFLP leader: The Great Return March is a popular referendum on Palestinian rights and resistance | Fight Back! Further, Mizher said that the Palestinian people were united today in confronting all of the schemes to deny their rights, including the “Deal of the Century,” the declaration of the transfer of the U.S. embassy to Jerusalem and the targeting of refugee rights. The Marches of Return impose a new equation on the occupation and the international community and make clear that the Palestinian people will never abandon their rights and will determinedly confront all such attempts. 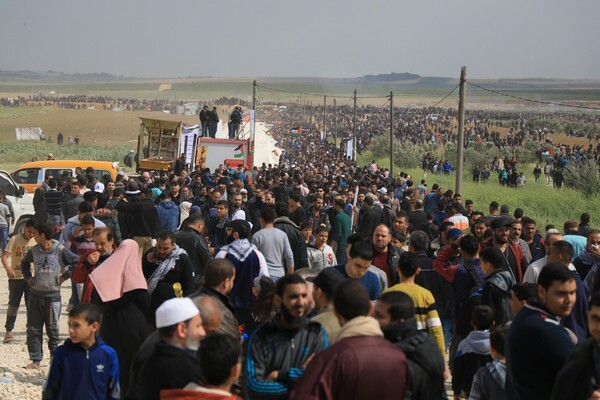 “The criminal attack by Zionist soldiers on Palestinians today in the March of Return is proof of the state of chaos that has persisted for many days and of their utter inability to break the will of resistance and steadfastness among the Palestinian people who gathered in their thousands today,” Mizher said. “This unified national scene today reflects the steadfastness of the Palestinian people and their attachment to their land, the land of their ancestors for generations. This is the true expression of the will of our people…confrontation of the occupation is the most effective means to restore national unity and rearrange the Palestinian house,” noted Mizher. 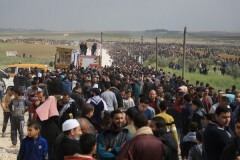 He concluded by saluting the Palestinian masses in the homeland and in exile, especially those in Occupied Palestine ’48, who today commemorated the anniversary of Land Day alongside their people in the Gaza Strip, confirming to the occupier that all Palestinians are united and firmly rooted in the land.